Alessi Michael Graves Spargisale Salt Castor (ALSALTC) at Pure Design / Accessories / Decorations ::: Furniture for the Home, Office, Home Office, and More at Pure Design Online! The Alessi Michael Graves Salt Castor adds some real flavor to modern tabletops. 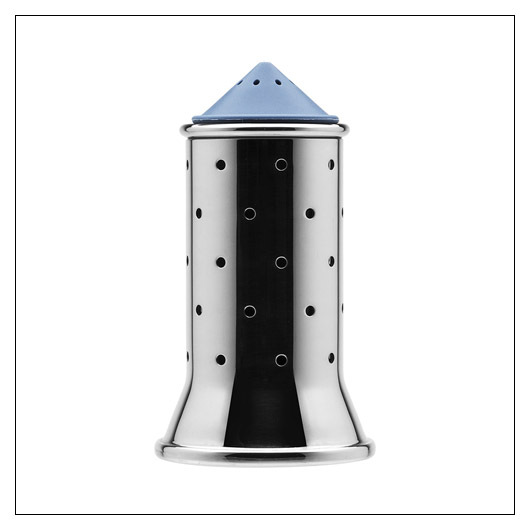 Its cylindrical, perforated stainless steel container is coated in a gleaming Mirror Polished finish, while the base and lid are made out of colored polyamide. Pairs perfectly with the Michael Graves Pepper Mill.